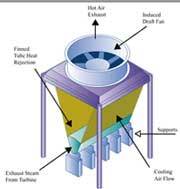 Steamflo air-cooled steam condenser is the first V-frame air-cooled steam condenser engineered to operate in extreme cold. Steamflo air-cooled steam condenser is the first V-frame air-cooled steam condenser engineered to operate in extreme cold. It transfers heat to a secondary medium that won't freeze until temperatures drop below –100°F. Its unique design eliminates the potential of non-condensables being trapped in finned tubes and prevents damage, deformation or ruptures to fin tube bundles. Hudson Products Corp., 6464 Savoy Drive, Suite 800, Houston, TX 77036. Tel: 713 914-5700; Fax: 713-914-5991.